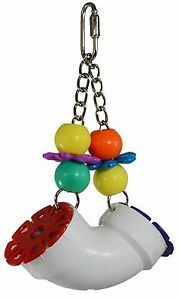 Another fun foraging toy from Super Bird Creations ... and an inexpensive way to introduce your parrot into foraging. Place your birds' favorite treat inside and watch the fun. Your feathered family get both mental and physical exercise when trying to retrieve the hidden treats! Great for stimulating their foraging instinct ... suitable for beginner or advanced "foragers". Designed for the mid to larger size (i.e., Amazon, Eclectus, Greys, small cockatoos and mini macaws) parrots in your house.